The National Highway Traffic Administration has recalled 7.8 million vehicles that use Takata airbags due to a malfunction that expels shrapnel when they deploy. The defective airbags are responsible for at least two reported deaths and suspected to have injured many more. The recall affects multiple vehicle models produced since 2000 by BMW, Subaru, Chrysler, Ford, General Motors, Mazda, Honda, Mitsubishi, Nissan and Toyota. How Does the Defect Occur? The chemical propellant that deploys the airbag is to blame for the defect and it is exacerbated by humid climates. 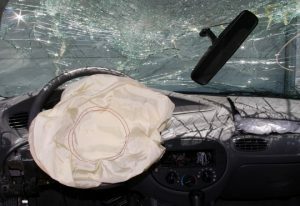 The housing of the airbag becomes loose, and it sends shrapnel at the driver upon deployment. Pieces of metal and plastic from the airbag housing punctured the face and chest of the two victims confirmed to be killed by the defective airbags. 7.8 million cars have been officially recalled by the NHTSA due to the defective airbags. Automakers using the defunct airbag have reached out to their customers and alerted them of the defect. So if you have a defective airbag, you are likely already aware of it. However, if you are unsure, you can check the NHTSA website for information about the specific vehicles affected. Airbags are supposed to help prevent injuries, not make them worse. If you have been injured by a faulty Takata airbag, then the first thing you need to do is call 911 and get the medical help that you require. After you have been seen by a doctor, call the Parker Law Firm. We will diligently pursue the facts behind your case and help you get the compensation you deserve. Our attorneys truly care about their clients and take pride in helping those who have been seriously injured to put their lives back together. At the Parker Law Firm, People Matter. Call us today at (817) 503-9200 for a Complimentary Strategy Session.